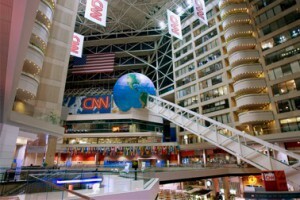 In an opinion piece on the Atlanta Journal Constitution, reporter Matt Kempner writes about how CNN’s executives in New York City slowly moved almost everything (especially talent) from Ted Turner’s CNN Center in Atlanta. They carted off the best stuff slowly. Like we wouldn’t notice. An on-air anchor here, a creative guy there. They left the studios. And the tour guides at CNN Center. And more than 5,000 other employees. And the signs along the highway for TBS, TNT and Cartoon Network. But don’t be fooled. The powers over Turner Broadcasting System eventually made off with stuff metro Atlanta doesn’t want to do without. They shifted several CNN shows elsewhere. They cut lots of jobs. And now they’ve gutted much of the senior leadership ranks here and put their offices in New York and Los Angeles, far from the house that Ted Turner built. So now at Turner, which helped set Atlanta’s international image, many of the top bosses have become visitors. Among those already gone from the ATL are Turner’s chief executive, the chief financial officer, the president of CNN Worldwide (plus his heads of programming, marketing, digital and HLN) and the president of TBS and TNT, who also functions at the chief creative officer for Turner Entertainment. For 40-plus years we could write “Atlanta-based Turner Broadcasting” in our news stories. That phrase no longer works. A year and a half ago, John Martin became the company’s first chief executive not based in Atlanta. He’s in New York, close to his boss at parent company Time Warner. And then they stopped serving bison burgers at the cafeteria… actually, they closed the cafeteria.